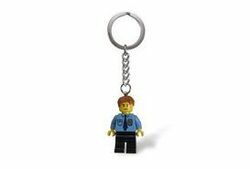 853091 City Policeman Key Chain is a City Key Chains set released in 2011. This is a description taken from LEGO.com. Please do not modify it. Lay down the law and order! Take the LEGO® arm of the law with you everywhere you go with an authentic LEGO City Policeman minifigure! Makes a great partner for fighting crime and taking control of traffic! Add this awesome officer to your keys or backpack! 853091 City Policeman Key Chain | 853092 City Burglars Magnet Set | 853096 City Astronaut Key Chain | Brickmaster City | LEGO City Ultimate Sticker Collection | Escape from LEGO City! | Fight This Fire! | Fireman Minifigure Clock | Heroes! | LEGO Pre-Spring 2011 | Policeman Minifigure Clock | Work This Farm! Facts about "853091 City Policeman Key Chain"
ShopDescription Lay down the law and order! Lay down the law and order!